The Mark of Trauma, Unmasked. ​This article makes known a simple technique that can be used along with traditional NES miHealth and infoceutical protocols by both practitioners and clients, without requiring any specialized training, to help identify and, ultimately, defuse traumatic memories. A closer look at the Brain Holograms on the NES ProVision Mind screen offers specific insights into mental/emotional aspects of energetic distortions in the body-field. This article will offer a simple technique that can be used along with traditional NES miHealth and infoceutical protocols by both practitioners and clients, without requiring any specialized training, to help defuse traumatic memories. As described in the ProVision Help Files, the experience of an unexpected, dramatic, emotional shock in the absence of an adequate coping strategy tends to leave an imprint in the subconscious. NES research suggests that these shock/conflicts result in energetic oscillations within the brain. If the shock is not liberated either naturally or through therapy, it can, over time, manifest as a physical health issue. Research has further established correlations between the originating type of shock/conflict and so-called relay points in the brain where the oscillations occur. Moreover, these relay points have been linked to specific tissues in the body, establishing a connection between the experience of shocks in the mental/emotional body and the manifestation of symptoms in the physical body. 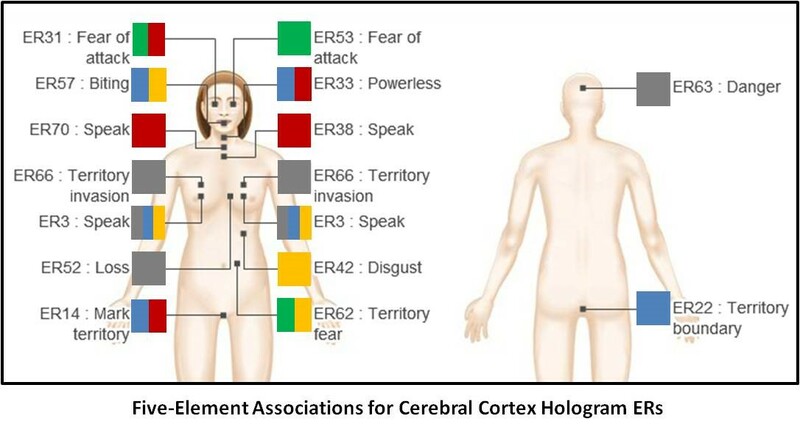 A detailed review of the priorities assigned to individual Energetic Rejuvenators (ERs) on a given Brain Hologram screen in a ProVision scan, along with their on-screen attributes and Help-File keynotes, may help identify specific unresolved emotional challenges that are negatively impacting a client’s health and well-being. In addition to miHealth protocols and affirmations suggested in the Help Files, we can also engage a set of so-called Neurovascular (NV) reflex points[1,2] to address emotional aspects of energetic distortions. The "face-touch" is a comfort thing, and here's why. NV reflex points affect blood circulation and can be used to reprogram the autonomic nervous system. They are held with a light touch. 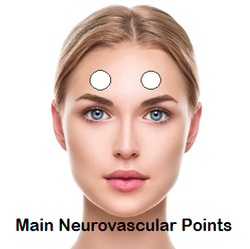 We instinctively know about the so-called Main NV points located on the frontal eminences (directly above the eyes) on the forehead; they are typically the first place we will go to with one or both hands in response to a shock. Holding these points will help to return blood to the forebrain, gain a better perspective of the situation, and think more clearly. ​In addition to the Main NV point on the forehead, there are specific NV points associated with the Five Elements of Traditional Chinese Medicine (Water, Wood, Fire, Earth, and Metal). Their respective locations are shown below. Prolonged stress and traumatic experiences can move us from the sustaining emotional state into the primary stress emotion. 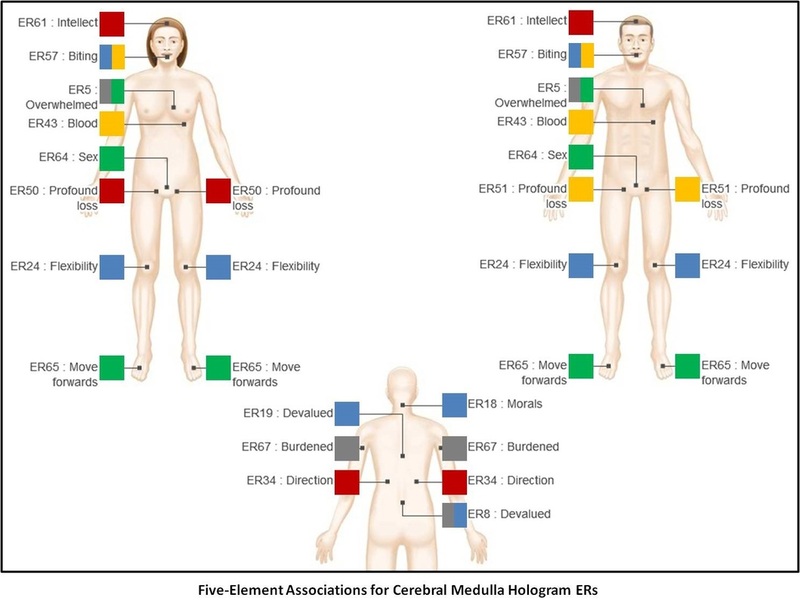 All ERs depicted on the Brain Hologram screens can be mapped to at least one of the five elements through their associations with the Energetic Integrators, which in turn relate to the main TCM meridians and their corresponding elements. The primary stress emotions provide a framework for the attributes/ keynotes associated with the ERs. 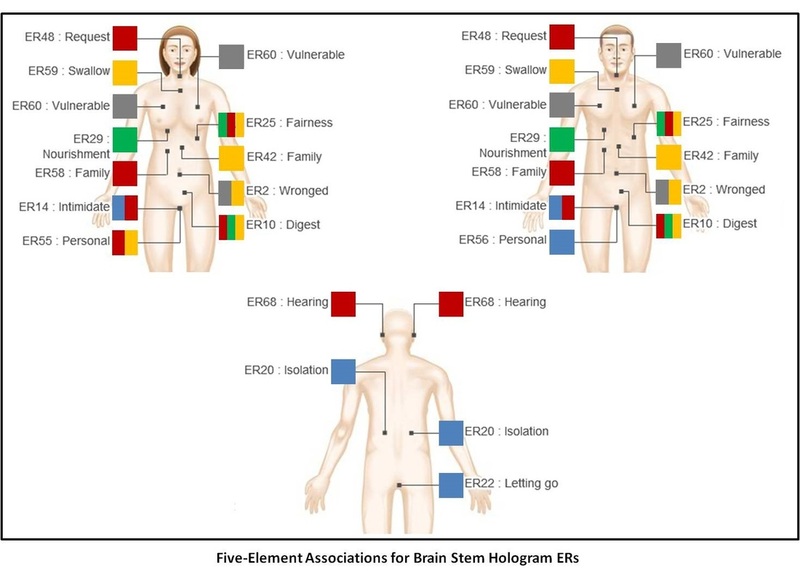 The pictures below show the associations of the ERs on the four Brain Hologram screens with the five elements. The colors filling the individual squares reflect their respective associations with the elements: blue for Water, green for Wood, red for Fire, yellow for Earth, and grey for Metal. 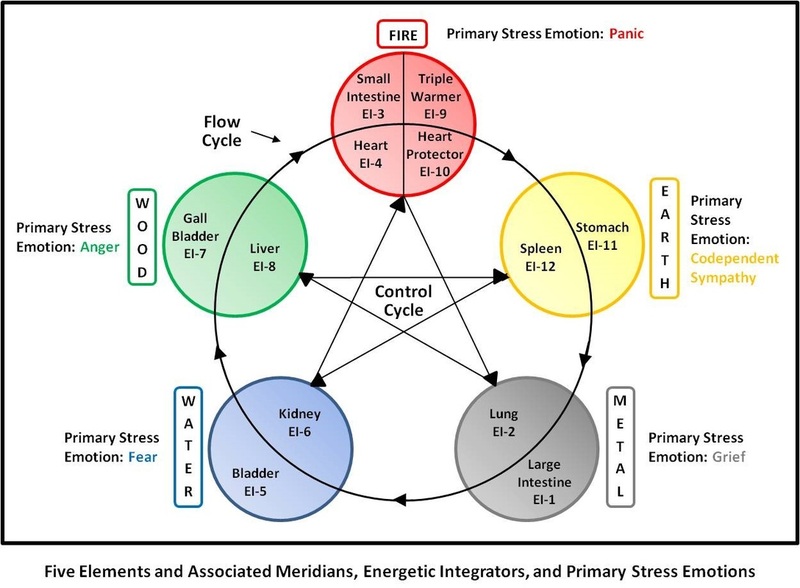 The protocol outlined below allows to address mental/emotional aspects related to specific ERs by working with the associated elemental NV points. It can be applied during consultations either by the practitioner or by the client as well as for self-care at home, as a complement to NES miHealth and infoceutical protocols and any other applicable modalities. 7. Continue this process for additional ERs on the same Brain Hologram screen or move on to another Brain Hologram, as desired. Thie, John, and Matthew Thie. Touch for Health. Camarillo, CA: DeVorss Publications, 2005.